There is no better way to finish off a busy week than with a weekend full of baked goods! At work we saw the passage of two major pieces of legislation on the Hill, I handed in my final paper for one summer course, I celebrated my birthday, and then I celebrated a friend's birthday. Paula Deen provided just what I needed...a chocolate crowd pleaser for my friend's b-day that didn't take much time which meant I could concentrate on my other more complicated recipe (will be posted soon). This recipe is so easy I have confidence that even those afraid of the kitchen would be able to make it. If you prefer not to use a box brownie mix you can simply substitute any homemade brownie recipe, but if you're in a time crunch using the box mix still produces an amazing result! Pour in half of the brownie batter and spread out to make sure it covers the entire pan. Place the candy bars side by side on top of the batter. Pour in the remaining batter and make sure all candy bars are covered. Bake according to package directions. Let cool completely before slicing. 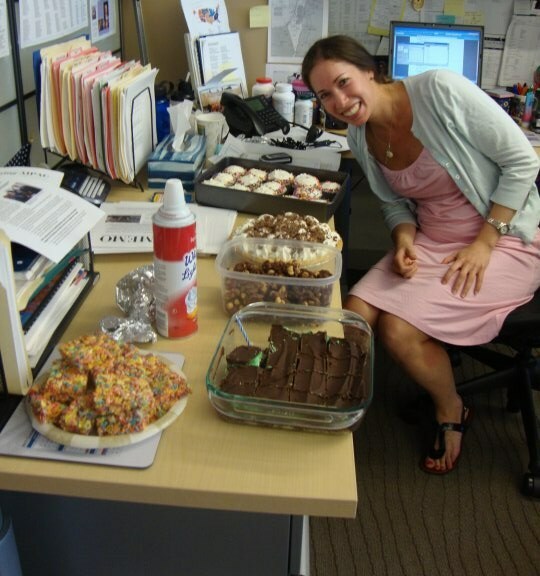 Whenever a birthday rolls around at the office we have a group of friends who will all bake for each other. It makes celebrating a birthday at the office worth going into work that day. Below are a few snapshots of the treats I received for my birthday last week. The birthday committee treated me well! Soda can cupcakes and Fruity pebble rice krispies! I mentioned in my last post that I have become a member of the Daring Bakers. The June 2010 Daring Bakers’ challenge was hosted by Dawn of Doable and Delicious. Dawn challenged the Daring Bakers’ to make Chocolate Pavlovas and Chocolate Mascarpone Mousse. The challenge recipe is based on a recipe from the book Chocolate Epiphany by Francois Payard. I really enjoyed my first challenge as a Daring Baker! I stepped outside of my comfort zone and tried something new that I likely never would have attempted otherwise. Place a rack in the center of the oven and preheat to 200º F degrees. Line two baking sheets with parchment paper and set aside. Bake for 3 hours until the meringues become dry and crisp. Cool and store in an airtight container for up to 3 days. Put ½ cup of the heavy cream and the lemon zest in a saucepan over medium high heat. Once warm, add the chocolate and whisk until melted and smooth. Transfer the mixture to a bowl and let sit at room temperature until cool. In a bowl, whisk together the egg yolks and sugar until the mixture turns pale yellow. Set aside. Combine the milk, cream, and vanilla in a saucepan over medium high heat, bringing the mixture to a boil. Take off the heat. Prepare the crème anglaise and make sure it has cooled completely. Slowly whisk the mascarpone and Sambucca into the creme anglaise and set aside. Put the heavy cream in a bowl and beat with electric mixer until very soft peaks are formed. Fold the cream into the mascarpone mixture. Pipe the mousse onto the pavlovas and drizzle with the mascarpone cream over the top. Dust with powdered sugar and fresh fruit if desired. I brought my pavlovas to a dinner party and assembled them with the help of my friends. After a long day of work I headed out for a drink with some friends and sure enough my love for baking ended up in conversation. I had never heard of Viennese Walnut Bars before this evening when a friend of mine said his Great Aunt had been making them for as long as he could remember. Of course I couldn't resist asking for the recipe and giving them a try. They have a nice shortbread crust, a chocolate walnut filling, and a sweet icing on top. 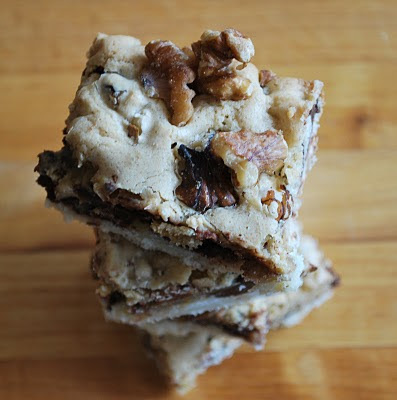 The flavor of the walnuts really permeates throughout the bar, so if you love the combination of chocolate and nuts this recipe is definitely for you! If you haven't been to Tastespotting you must click immediately. This is one of my favorite food blogs and I've been lucky enough to have a few photos accepted to the site- the Viennese Walnut Bars being one of them- along with my Devil's Food Cookies, Gooey Toffee Butter Cake, and Chocolate Chip Banana Bread! Check it out and let me know what you think. Also, I have submitted the Viennese Walnut Bars to the Magic Bullet Contest Giveaway, thanks to one of my readers. Wish me luck! **Update on the Magic Bullet Contest Giveaway: I was one of the winners!!! I can't wait to use my Magic Bullet set. Heat the oven to 350 degrees F and grease a 9x13 pan. Cream together the butter, cream cheese, and sugar. Add the flour and mix well. Pat into a 9x13 greased pan. Sprinkle the chocolate chips and chopped nuts on top making sure to coat evenly. Beat together the butter, brown sugar, eggs, water, and instant coffee (if you don't like coffee substitute water). Add in the flour, baking powder, and salt. Gently spread this mixture over the chocolate and nuts, making sure to cover the entire surface. Top with additional chopped nuts if desired. Bake for 30-35 minutes. Let cool in pan before cutting into pieces. When I first discovered the world of baking blogs I noticed several posts from different blogs all began with "For this month's Daring Bakers challenge..." After creating my own blog I decided to look into the Daring Bakers challenge and discovered that the Daring Bakers are a group of bakers from around the world who try the same new recipe once a month. Before applying for entry into the group I decided to try a recipe from a previous month's challenge as a test run. I thought homemade graham crackers would be a great start and boy was I right! 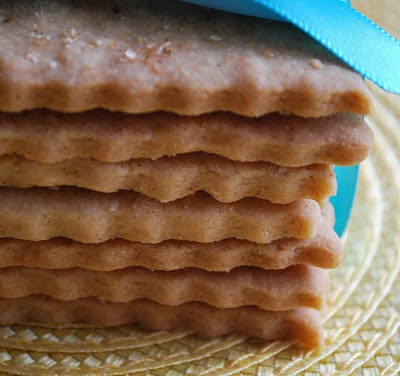 They looked and tasted like graham crackers should and I even got to use my new pastry cutter for the fluted edges. I was recently accepted to the Daring Bakers, so look out for my first "challenge" post later this month! Preheat the oven to 350 degrees F and line two baking sheets with parchment paper. Whisk together the flours, salt and cinnamon in a medium bowl. Set aside. In the bowl of an electric mixer, cream together on medium speed the butter and brown sugar for about 2 minutes. Scrape down the bowl, and beat in the honey. Stir in the dry ingredients on low speed. Scrape the dough out onto a sheet of plastic wrap and pat it into a disc. 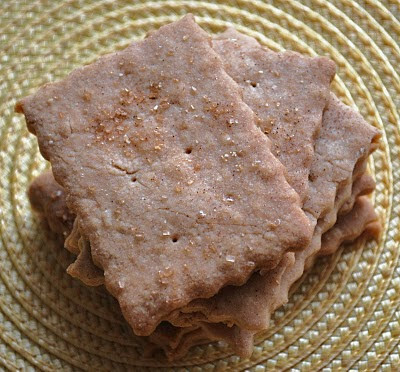 Refrigerate until firm but still pliable, about one hour. Turn the dough out onto a lightly floured surface and roll out to about an 1/8-inch thick. Use a cookie cutter or pastry cutter to cut out cookies and place on the prepared baking sheets. Sprinkle with the turbinado sugar and poke holes with a toothpick (if desired). Chill the cut cookies on the sheets for at least 15 minutes before baking. Bake 14 to 16 minutes until golden. Let the cookies set for a minute before transferring them to a wire rack to cool completely. If you have never tried a cake ball or cake pop you are certainly missing out and must find them immediately. To the best of my baking blog knowledge Bakerella was the first to popularize this idea back in 2008. Since then these little guys have popped up everywhere. I swear to you they are the most addicting things you'll ever try. If you bring them to a party I guarantee they will be gone before you even put down the platter. This latest batch of cake balls was made by special request for a friend's birthday. The theme was "Washington, D.C." so I was informed the cake balls should be red, white, and blue. I ran out of blue candy melts, so I decided to use the red and white melts as the base and decorate the tops with the blue. I would say they turned out very "D.C", wouldn't you?! Because these really are the ultimate snack I submitted them to the Magic Bullet Contest/Giveaway! Bake the cake according to the instructions on the box. Let cool to room temperature and then scrape half of the cake into a large mixing bowl. Scoop half of the can of cream cheese frosting into the mixing bowl and mix with the cake. Dump in the rest of the cake and frosting and mix together until completely combined. Cover the bowl and place in the fridge for about 20-30 minutes. Remove the bowl from the fridge and roll the mixture into quarter size balls. You should make about 40-50. (If you are making cake pops this is when you would insert the lollipop sticks into the balls) Lay the balls on a cookie sheet lined with parchment paper and place in the fridge for a few hours. Once firm enough to handle, melt the candy melts according to the package and carefully roll the balls in the mixture. Tap off the extra chocolate melt and lay back on the cookie sheet. Place back in the fridge until you are ready to serve and devour. Here are a couple pictures of my cake pops.